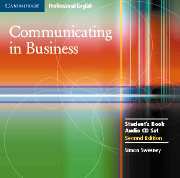 Communicating in Business is a short American English course for intermediate level students in or preparing for work who need to improve their communicative ability when socializing, telephoning, presenting, taking part in meetings and negotiating. Students analyze the requirements of the relevant communicative situation and are then given controlled and free stage practice to develop confidence, fluency, range and effectiveness. The second edition includes a Quick Communication Check in each unit and the material has been thoroughly updated with a greater focus on email communication.